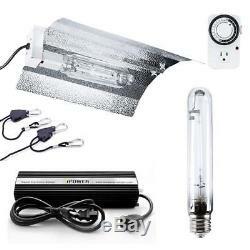 IPower 400 Watt HPS Digital Dimmable Grow Light System Kits Wing Reflector Set with Timer. From seeding to flowering, iPower Grow Light System has your plant covered with all the light it will ever need. HID provides the most lumens per dollar, which means the most yields for your investment. This kit eliminates the need for mixing incandescent with fluorescent or additional LEDs that provide little gains at 2 to 3 times the cost. The balanced spectrum set of lights will not only be well-absorbed by plant's chlorophylls, but also promotes healthy chlorophyll production and regulates plant life cycle. IPower Basic Gull Wing Reflector Hood. Dimension: 21 x 17 x 6 inch. Up to 4' x 4' light coverage. Fits for 250W, 400W, 600W, 1000W HPS / MH grow light system. Built-in 10-ft heavy duty lamp cord (UL Listed). 0.4mm highly 95% reflective textured German aluminum, can intensify light and enlarge lighting area. IPower 400W Digital Dimmable Electronic Ballast. Dimmable Options: 50%, 75%, 100%. Free heavy-duty power cord included. 30% more lumens than magnetic ballasts for improved yields. Fast lamp ignition by lighting up the bulbs within 1-2 mins max. High frequency output results in less power loss and Zero acoustic resonance. Automatically converts between HPS and MH light bulbs by micro-chip programming. 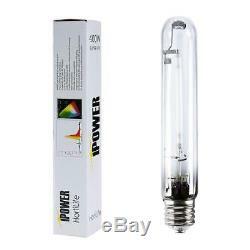 IPower 400W High Pressure Sodium (HPS) Grow Light Bulb. Initial lumen: 55,000 lumens. Bulb Lifespan: 32,000 hours. Allow 3-5 minutes for full bright. Maintaining over 90% of initial lumen output after running for 6,500 hours. Please wait at least 5 minutes after power shut off before striking again. Red & orange spectrum and high PAR (Photosynthetic Active Radiation) to stimulate flower growth and enhance fruiting. 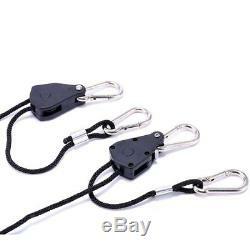 IPower 1/8 Inch 8-Feet Long Heavy Duty Adjustable Rope Clip Hanger Rope. Heavy duty of 150-pounds weight capacity! Hook Material: Zinc Plated Steel / Metal Internal Gears. 8-feet rope length for all the height you need for your fixture! 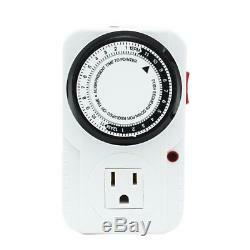 IPower 24 Hour Plug-in Mechanical Timer, UL Listed. Rated Voltage: 125V AC, 60 Hz, 1/2HP. Grounded design to ensure safety use. Allow easy and accurate on and off timing of lighting systems or odor scrubbing systems for plants. Essential for everyday home kitchen use, compact fluorescent lighting, LED bulbs, all hydroponic system application. CAUTION: This system will generate too much heat to be used in an enclosed area without ventilation. 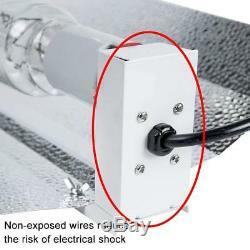 Adequate ventilation is required for all iPower grow light systems. We recommend the use of an iPower inline fan. 2399 Bateman Ave, Duarte, CA 91010. 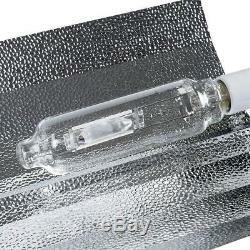 Hydroponics, hps, grow lights, horticulture, grow lamps We have hundreds in stock. Our flawless ratings, feedbacks and praises are not just vouches of excellence but returning customers, ranging from single-light to hundred-light setups, time after time. 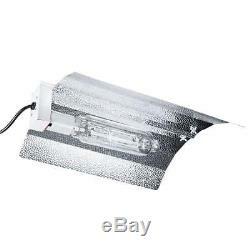 Ballast color & shape may vary iPower Digital Dimmable Ballast ---100V265V wide range with 120V/240V working voltage. Adjustable at 100%, 75% and 50% for maximum efficiency, Up to 30% more lumens than magnetic ballasts for improved yields ---1x Heavy duty power cord; Standard hydroponic S-plug output. HPS, MH & Double Ended HPS lamp supported, convertible with micro-chip programming ---LED indicator for easy self-diagnosis and better protect your ballast for extra longer service life. Short circuit protection by automatic power shut off for ultimate safety. Local pick-ups are always welcomed (by appointment only). Hydroponics, hps, grow lights, horticulture, grow lamps. We have hundreds in stock. IPower Grow Light 400W Digital Dimmable Ballast. Ballast color & shape may vary. 100V265V wide range with 120V/240V working voltage. Adjustable at 100%, 75% and 50% for maximum efficiency, Up to 30% more lumens than magnetic ballasts for improved yields. 1x Heavy duty power cord; Standard hydroponic S-plug output. HPS, MH & Double Ended HPS lamp supported, convertible with micro-chip programming. LED indicator for easy self-diagnosis and better protect your ballast for extra longer service life. Power surges, Ignition Failure Protection; Overheating Protection; End-of-Bulb-Life Protection. Fast lamp ignition by lighting up the bulbs within 1-2mins max, Stable light output by constant lamp voltage, lamps will be flicker free. Built-in cooling fan and Graduating fin design to minimize ballast temperature. City of Industry, CA 91746. The item "IPower 400W HPS Grow Light System Kits Wing Reflector Set with Timer" is in sale since Monday, October 28, 2013. This item is in the category "Home & Garden\Yard, Garden & Outdoor Living\Gardening Supplies\Hydroponics & Seed Starting\Grow Light Kits". The seller is "hpsgrowlightstore" and is located in La Puente, California. This item can be shipped to United States, Canada, United Kingdom, China, Mexico, Germany, Japan, Brazil, France, Australia, Denmark, Romania, Slovakia, Bulgaria, Czech republic, Finland, Hungary, Latvia, Lithuania, Malta, Estonia, Greece, Portugal, Cyprus, Slovenia, Sweden, South Korea, Indonesia, Taiwan, South africa, Thailand, Belgium, Hong Kong, Ireland, Netherlands, Poland, Spain, Italy, Austria, Israel, New Zealand, Singapore, Switzerland, Norway, Saudi arabia, Ukraine, United arab emirates, Qatar, Kuwait, Bahrain, Croatia, Malaysia, Chile, Colombia, Costa rica, Panama, Trinidad and tobago, Guatemala, Honduras, Jamaica.